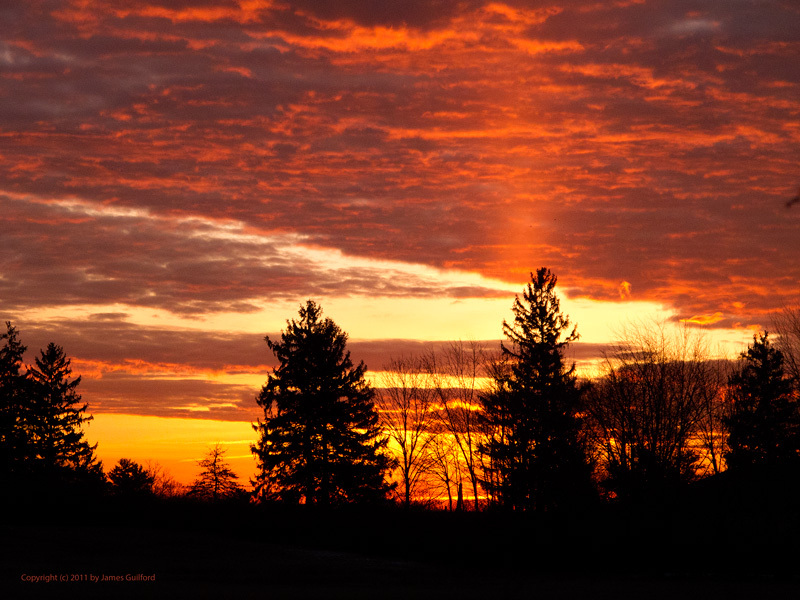 A sun pillar rises into a firey December morning sky. In the mornings and evenings of the cold seasons we are occasionally favored with glorious sunrises and sunsets. A few of those beautiful moments boast something beyond colored clouds and sky; they host sun pillars! Sun pillars are the result of low-angle sunlight reflected from flat plate-shaped ice crystals suspended high in the air. Pillars can extend from approximately where the Sun sits, near the horizon, to points straight up and high above. Monday morning, December 13, presented one of those fleeting moments as I drove to the office. I hurriedly pulled into a parking lot, extracted my camera from its case, and shot a few photos of the beautiful sky. A few minutes later, with the Sun slightly higher and the clouds slightly heavier, the fiery colors had faded and the sun pillar was gone. Pillars, such as I saw, can also occur at night in the colder months. Lights from streetlamps, parking lots, buildings, and so forth can be reflected by atmospheric ice and produce delicately beautiful light pillars that are often mistaken for auroras. So as you start or end your day, take the occasional glance at the sky. Perhaps you, too, will see the pillars of the Sun! This entry was posted in Uncategorized and tagged atmosphere, aurora, light pillar, northeast ohio, ohio, sun, sun pillar, sunrise, winter. Bookmark the permalink.